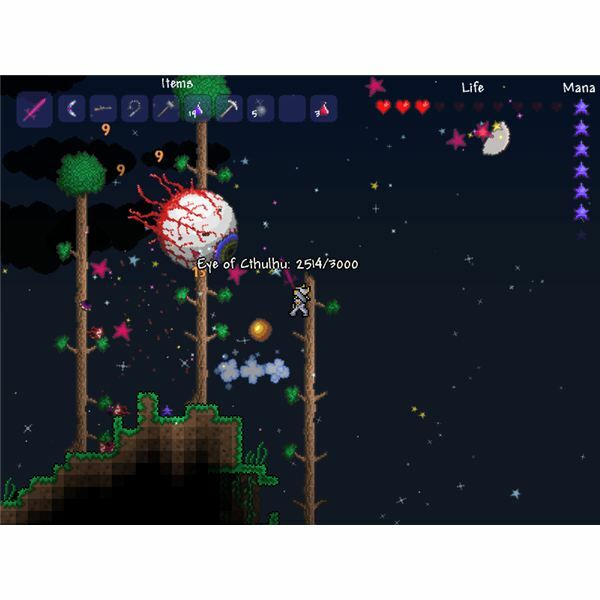 In Terraria, Crafting helps you to create items, weapons and armor. You can also create magical potions that will help you restore mana and health. Before reading this guide, you will have to learn how to craft items. To know what is crafting and how to craft items, read Terraria Crafting Guide: The Basics. To create advance items and weapons, you will need certain placeable furniture items. These furniture items include Work Bench, Anvil, Alchemy Station and Furnace. For example, Furnace helps you smelt ore, which can then be used to create advance weapons at an Anvil. So, without further ado, here are some of the important Terraria Recipes to craft basic and advance items/weapons. A torch acts as an important portable light source when darkness falls. 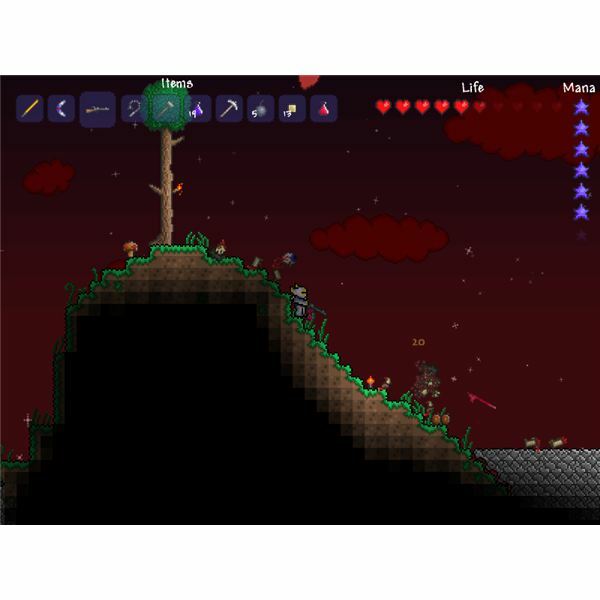 You can place them anywhere or hold a torch when darkness falls in the world of Terraria. To craft a torch, you will need 1 wood and 1 gel. The player can stack 250 woods by cutting down a tree. To get Gel, the player has to kill slimes – monsters that look like transparent blobs. Sticky Bombs stick to the surface when thrown. The damage inflicted by a Sticky Bomb is same as the Bomb. It sticks to any surface, but won’t stick to an enemy or NPC. You will have to combine 5 Gel with a Bomb to craft a Sticky Bomb. You can buy Bombs for 5 silver. Visit a demolitionist to buy one. You can also collect them from broken pots. Bombs inflict 100 damage and can destroy weak background tiles. Wood platforms act like a bridge or ladder and is basically a thin flat block. Players can jump over it, or cover dangerous pits. It requires 1 Wood. The workbench can be placed on the ground and various additional items can be crafted using the workbench. To craft this basic item, you will require 10 Wood. You will find workbench in your inventory. Press the esc key and drag and drop this item at the top of the screen. Then select it and left-click the ground to place the item. You can then use it by standing near the workbench and press esc to open the inventory. You will have access to additional recipes if you are near the workbench. They are more powerful than wooden arrows because every flaming arrow comes with a torch. You will need a bow to fire these arrows. They inflict 7 damage. To build a set of five flaming arrows, you will need one torch and five wooden arrows. You can collect wooden arrows from pots or chests in the Terraria universe. To craft a set of 3 wooden arrows, you will need 1 wood and 1 stone. To craft mana crystals, you will need 10 fallen stars – stars that fall from the sky at night time. When they fall to the ground they glow. You can store them in piggy banks, chests or your inventory. Make sure you collect them from the ground before sunrise, or else they will disappear. The mana crystal created by combining 10 stars will increase your maximum mana limit by 20. You will need to combine 6 Wood at a workbench to craft this item. While wooden doors are perceived as items of decoration, you can use them to make a room for non-player characters to live in or to avoid monsters. You need to combine 4 Wood to craft this item. It is an item of decoration and is used along with the door and table to make room for non-player characters. You will need 6 Wood to craft this item. You can use them as direction or distance signs, landmarks or can make a map to help other players. Wooden signs can be edited and any player can edit the sign. Chests are used to store items. You can also find chests in dungeons, caves, oceans and islands. They may contain certain items that can be used for crafting, weapons and unique accessories. To craft a chest, you will have to combine 8 Wood with 2 Iron bars. The selling price of a chest is 3 silver coins. The table is an item of decoration and requires 8 Wood. You can convert it into an Alchemy station by having a bottle placed on top of the table. You can craft items such as watches, goggles and a depth meter as long as you have a chair nearby. Tables can be sold for 30 copper coins. Wooden swords do 7 damage and are generally perceived as weapons with low damage potential. You will need 7 wood to create one sword. To create a set of 3 wooden arrows, just combine 1 stone block with 1 wood. To craft a wooden bow, you will require 10 Wood. You will have to use the bow with the wooden arrow to inflict 5 damage. You can sell the bow for 20 copper coins. The wooden hammer belongs to the first tier of hammers and should be immediately replaced with the copper hammer to ensure greater damage. Hammers are usually used to break background objects. You will need 8 wood and have to be near the workbench to create one. These act as a light source when darkness falls and can be placed on top of a table of chair. To create a candle, you will have to combine 1 torch with 1 gold bar. You can easily craft silk if you have at least 10 cobwebs. You will have to be at close proximity to the work bench to craft one. Cobwebs have a white and grey texture and can be easily destroyed using a wooden hammer or any tool. You can easily find them in underground caverns. Five Silk can later be combined with 10 wood to craft bed, which act as your spawn point when you right-click on it. As the name suggests, a watch can be used to check the time of the day. 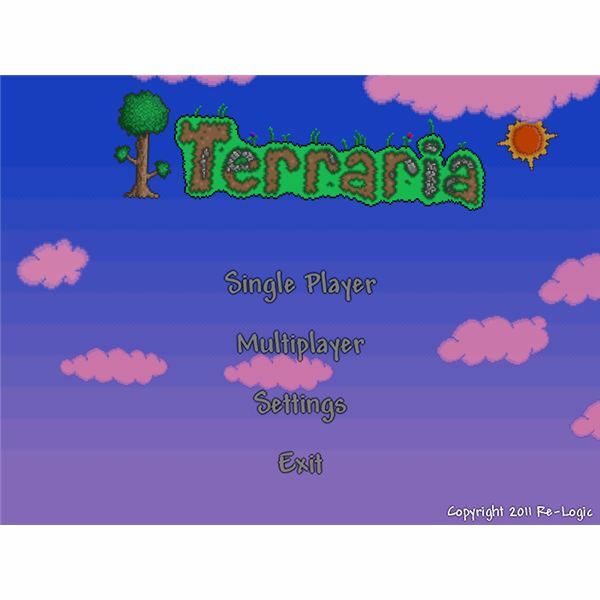 Once equipped, you will notice the time at the top-left hand corner of your game screen. You will need a table and chair beside a work bench to create watches. To create a copper watch, combine 1 iron chain with a copper block. To craft a silver watch, combine iron chain with a silver block. To craft a gold watch, combine one iron chain with a gold block. The Necro gear consists of a helmet, breastplate and greaves. Once you are equipped with all three items, you will recieve a 30 percent speed boost in movement. You will also gain 6 defense points. To craft a Necro Helmet, combine 40 cobwebs with twenty five bones. Bones are enemy loot dropped on killing burning skulls, angry bones and dark casters in dungeons. You can also throw bones at an enemy to inflict maximum damage (22 damage points) at a quick pace. To craft the breastplate, combine fifty cobwebs with 35 bones. To craft greaves, you will need forty five cobwebs and thirty bones. In Terraria, leather is a cloth material used to craft the archeologist’s jacket and pants. To craft leather you will require 5 rotten chunks. To craft Archeologist’s Jacket, you will need 15 leather and to craft the pants, you will need 15 additional leather. 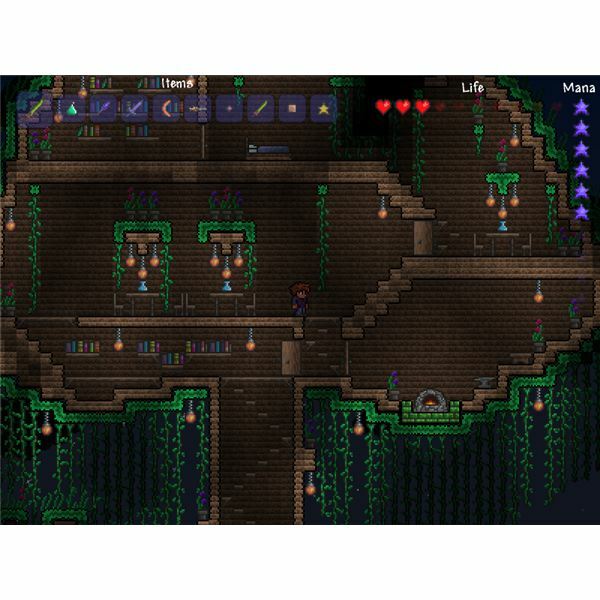 In the list of Terraria crafting recipes, the Alchemy Station is used to concoct potions that heal health and restore mana. To craft an alchemy station, there is no need to combine any items. All you need is a work bench or a table and a bottle, which has to be placed on top of the wooden surface. Use the same steps as described in the work bench section to place table and bottle from the top of the screen. You will have to be in close proximity to the workbench or table to create these healing potions. A set of two lesser healing portion costs 2 bottles, 1 mushroom and 2 gels. Bottles can be crafted from glass. You can create two bottles from 1 block of glass. You can find normal mushrooms in clusters on the surface. Unique glowing mushrooms can be found in large clusters in underground caves. Drinking this potion restores 100 life. You will have to combine 2 bottles of lesser healing potion, 1 fallen star and 1 glowing mushroom. It has the ability to restore 200 life. A set of two bottles of lesser mana potions will require you to combine 2 Gels with two Bottles. Drinking this potion restores 100 mana. You will need 2 bottles of Mana potion and 1 glowing mushroom to craft the mana potion. Drinking will restore 200 mana points. Restoration potions not only restore life, but also restore mana. To create the lesser potion, combine 1 bottle of lesser healing potion with 1 bottle of lesser mana potion. This potion will restore 100 mana and 100 life. Drinking this potion will double up your mana and life restoration. To create one, just combine 1 bottle of healing potion with 1 bottle mana potion. This purple color powder is often thrown at enemies and is an important ingredient is crafting. You can throw it at a monster and inflict some damage. To create 5 vile powder, you will need 1 vile mushroom. You can farm these inedible mushrooms using corruption seeds. You can make the powder with the mushroom at the Alchemy Station. Like the workbench, the furnace is a furniture item, but is used to smelt ores of different metals, such as copper, silver and gold, to craft bars of the same materials. The smelted pure metal is further used to craft advanced weaponry at the Anvil. To craft a furnace, combine 4 Wood, 3 Torch and 20 Stone. You can easily find stones in the underworld and in the rock layer. If you are lucky, you can find stones on the surface of the overworld. To craft one copper bar, you will need to smelt 3 copper ore. You can find copper ore on the hill sides and the caves. To craft one iron bar, you will have to smelt 3 iron ore in the furnace. Iron ore is very common and found everywhere. To create one silver bar, you will need 4 silver ore and the furnace. The ore is grayish-silvery in color and is usually found underground in 10-20 blocks. To craft one gold bar, smelt 4 gold ore. They're found underground and can be easily mined using a pickaxe. To craft a Demonite Bar, you will need to combine 4 demonite ores. These ore is usually dropped as loot by defeated bosses. To craft glass, you will need two blocks of sand block, which is found in the hill side, and commonly found in caves. Without bottles, you cannot create potions, and without glass you cannot craft bottles. You will need at least 1 glass and the furnace to create a set of 2 bottles. The anvil is one of the most important furniture items in Terraria. With this furniture placed on the ground, you can craft be advanced weapons and armors from the silver, copper, gold and meteorite bars smelt on the furnace. To build one, you will require five iron bars and a furnace to smelt them and create this furniture. If you have surplus coins, just purchase the Anvil with 50 silver coins. To make a copper pickaxe, you will need to combine 4 Wood and 12 copper bar. A metal pickaxe is an excellent item to mine ores and break background objects quickly. This item inflicts 5 damage and boasts an average speed. To make a copper axe, combine 3 Wood with 9 Copper Bars. It has 8 percent power and does 4 damage. It has a relatively slower speed than a copper pickaxe. To craft a copper hammer, you will have to combine 3 Wood and 10 copper bar. It inflicts maximum damage, but is very slow compared to other axes. To build a copper broadsword, you will need 8 copper bars. It has average speed and inflicts 6 damage. To build a shortsword made from copper, you will need seven Copper Bar. It has a quick speed in damaging objects and monsters and inflicts 8 damage. To craft a copper bow, all you need is 7 Copper Bar. Creating a copper helmet will require 15 Copper Bar. The helmet has 1 defense point. Copper Chainmail needs 25 Copper Bar and has 2 defense. To craft Copper Greaves, you will need 20 Copper Bar. It provides 1 defense. Wearing copper, helmet, chainmail, chandelier together will give you bonus 2 defense points. To craft Iron Pickaxe, all you need is 4 Wood and 12 Iron Bar. The Iron Pickaxe does 5 damage and has a faster speed than copper pickaxe. To craft an Iron Axe, combine 3 Wood with 9 Iron Bar. While this weapon has a slower speed, It does 7 damage. Crafting an Iron Hammer needs a combination of 3 Wood and 10 Iron Bar, It inflicts a maximum of 10 damage, but has slow speed. To craft an Iron Broadsword, all you need is 8 Iron Bar, whereas an Iron Shortsword requires only 7 Iron Bar. Both broadsword and shortsword do 8 damage, but the latter has a very fast speed. To craft an Iron Bow, you will need 7 Iron Bar. Iron Helmet will cost you 20 Iron bar, Iron Chainmail 30 and Iron Greaves 25. If you have a complete set to wear, you will get 2 bonus defense. To create silver/gold weapons and armor (pickaxe, axe, hammer, broadsword, shortsword, greaves, chainmail and helmet), you will need the same amount of metal bar/wood. Just follow the iron crafting recipe list and replace the amount of iron with gold and silver to create these weapons and armors.